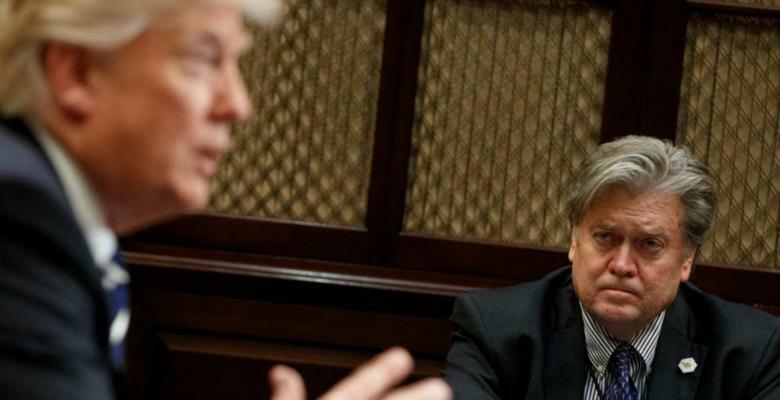 For better or worse (mostly the latter), many of Donald Trump’s actions thus far as President bear the imprimatur of former White House Chief Strategist Steve Bannon. TIME magazine even went so far as to plaster Bannon’s somewhat terrifying mug on the cover next to the headline “The Great Manipulator,” to President Trump’s great dismay. It was one of the worst-kept secrets in Washington: the majority of the executive actions taken by Trump were not of his own design, but rather were in keeping with Bannon’s “anti-globalist” and nationalistic ethos. And though Trump may have privately chafed at the minimizing of his role in policy implementation, there is little to suggest that our President comprehends of the nuances of government or is willing to learn them. Any other staffer who courted such attention would likely find themselves on the outs in a heartbeat, but due to his outsized influence, Bannon emerged largely unscathed — that is, until Trump replaced former Chief of Staff Reince Priebus with General John Kelly and the house cleaning began. According to a report, Kelly informed Bannon late last month that Bannon would need to leave his position at the White House; Bannon, who had previously mentioned that he “dreaded” going back to the White House where he was “just another staffer,” agreed to an amicable parting of ways, with Bannon’s departure planned for mid-August. Then came the events in Charlottesville last weekend. Amid growing concerns that the Trump administration was a haven for white supremacists, Bannon was once again thrust into the spotlight. In a combined effort to distance the President from white nationalist elements in his own administration and impose discipline in the White House, General Kelly moved up Bannon’s departure to last Friday. The reaction to Bannon’s ouster has been mixed, with many on the left viewing the staff shakeup as a gesture more than anything else. Sure, Bannon may be out, but if the Trump administration were really serious about ridding itself of its ethno-nationalist elements, Senior Adviser Stephen Miller and Deputy Whatever-The-Hell-He-Does Sebastian Gorka need to go as well. Moderate conservatives are praising Bannon’s ouster as a harbinger of the elusive “Trump pivot” for which they’ve been waiting, though it seems a tad optimistic to assume that Trump is ever going to change given the ziggurat of evidence to the contrary. And then there’s the alt-right crowd, which believes that Bannon (who will return to Breitbart) will wage war on the elements of the Trump administration that hamstrung him in the White House. Due to increased media pressure, the thinking goes, Trump will have no choice but to move in the direction of Bannon’s choosing. In fact, some believe that Bannon will use Breitbart as a megaphone to air his grievances with individuals in the White House, such as Opioid Epidemic/Middle East/Global Economy guru Jared Kushner. So what will Bannon do? There are two possibilities: go to the mattresses, or use the media to influence Trump from the outside. While it’s theoretically possible that Bannon will use Breitbart solely as a bully pulpit to undermine the Trump administration at every turn, it is implausible. Satisfying though it may be for the rest of us to watch Breitbart and Trump engage in all-out war, it is highly unlikely that Bannon would waste such a unique opportunity to shape White House policy in favor of settling personal grudges. It’s far more probable that Bannon will use his considerable influence in the media to push Trump in his desired direction. More than any President before him, Trump is uniquely susceptible to public pressure, particularly from media outlets he follows. In other words, as long as they’re saying nice things about him, Trump listens to the media, and in some cases, he even takes his political cues from certain morning shows. In addition, Bannon and Trump still enjoy a good relationship. Therefore, it seems most likely that Bannon will privately try to nudge Trump in the direction of his choosing and only use Breitbart as a tool when all else fails. In fact, given Trump’s apparent fondness for Fox News, I wouldn’t be surprised if Breitbart moves in a more “traditional” conservative editorial direction and makes its ethno-nationalist leanings more subtle, allowing the site to catch the President’s eye. There is, of course, one more question: who will replace Steve Bannon in the White House? If Trump’s removal of Bannon (and not Miller or Gorka) was an attempt to rid the White House of the stench of white nationalism, it is sure to backfire. Though it is certainly not beyond the realm of possibility that Bannon is indeed a racist, of the three prominent White House advisers, Bannon’s track record is the least obviously racist. Stephen Miller, for one, has a history of bullying minority students, both in high school and during his college years at Duke University. And though Sebastian Gorka doesn’t appear to have a definitive job title in the Trump White House, he has ties to the Vitézi Rend (“Order of Knights”), an organization with Nazi roots. In contrast, though Bannon was the editor-in-chief of Breitbart when it unveiled its “Black Crime” section, Bannon himself has always carefully avoided making racially inflammatory statements, opting instead to traffic in the more subtle language of “anti-globalism” (which is, at its core, anti-immigrant and pro-ethno nationalism). As of this writing, it remains unclear who will succeed Steve Bannon (or whether anyone will). But make no mistake: Steve Bannon’s influence in the White House has not waned since his departure — if anything, it’s as strong as ever. And that should trouble any citizen who cares about true American values.